Hugh and Serena Hallam have made the decision to leave everything they knew in Charleston behind them, hoping to create a stable, productive home for themselves and their three children in the near-wilderness of West Tennessee. Though now war may loom on the horizon, life at Palmyra is good, for both themselves and—they believe—their slaves. Hugh is convinced that reasonable men of good will with a tolerant respect for their countrymen might yet prevail against the increasingly tense atmosphere that is dividing the two American cultures. Capable and practical, he is nevertheless considered by his neighbors to be an idealist, with progressive notions concerning the science of agriculture and the requirements of Southern commerce, an ambivalent attitude toward slavery, and a confidence about the way things should be done. But when events move their entire world toward destruction, Hugh’s values are put to the test, with only his surpassing love for Serena and his belief in himself to possibly sustain him. 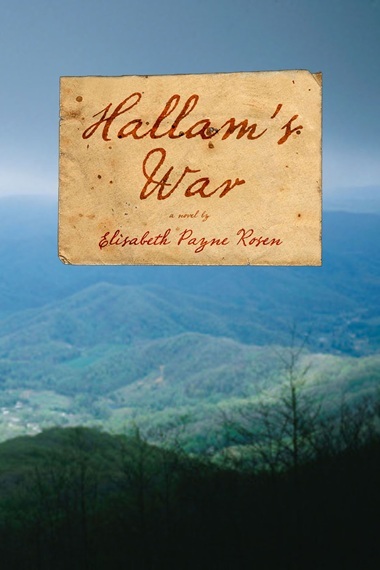 Hallam’s War is the saga of one man’s struggle to defend his family, his neighbors and his honor, and of the moral compromises forced upon an otherwise good man caught in a maelstrom that leaves him no acceptable choices. A man of remarkable resilience, resourcefulness and contradictions, Hugh must learn to face his own conscience with as much courage as he displays at Shiloh. Ultimately, Hugh and Serena confront the reality surrounding their relationships with their neighbors and with their slaves. If neither of them is completely transformed, each takes a step toward a new understanding. Elisabeth Payne Rosen’s near-epic debut is thoughtful, authentic and carefully researched. From Nashville and Memphis to Richmond, Charleston and Washington D.C., and across the bloody battlefields of Shiloh and Bull Run, Rosen brings vividly to life a heart-rending tale that resonates with deep personal grief shot through with moments of beauty and joy. In the end, there is hope for reconciliation among us all, even in the face of all the struggles that lie ahead. The early morning darkness reminded Hugh Hallam of Mexico; then as now he had saddled his horse before dawn and ridden out while the others slept, to survey the territory around San Augustín before the day’s assault and get the feel of the land in his bones. He wondered why he should think of the war now, when peace lay over the fields and the heat of the day was still a long way off. Beyond the fences, the cotton lay in dark, leafy rows in the fading starlight, nothing like the stony wasteland of the pedregal fourteen years ago, before the battle that would rage all day towards Churubusco. Behind him in the silent house, his wife, Serena, would have drowsed back into sleep by now. They had made love early, while it was still cool. He remembered her body on the bare sheets, the heat and softness of her skin. No smoke arose yet from the brick kitchen as he rode by: Markie was not yet up. He had drunk a cup of cold water from the cistern on his way out. The moon had set by the time he closed the last gate behind him and headed out towards the orchard, past the long, low house and through the two short lines of slave cabins. He had built the first of them himself—his only shelter that first winter in Tennessee, when he’d left Serena and the children behind and come out ahead to clear the land. The others he had added as necessity dictated over the years. They were small, plain structures, but of good quality by the standards of the neighborhood; he had allowed his slaves to build their own chimneys of solid brick, purchased by himself at the mason’s, and not the usual wattle and daub that managed to catch fire once or twice a year. Each cabin had a small yard where its inhabitants could keep chickens or tend a patch of greens. Five of the cabins were silent and dark now, their narrow doors open to catch the coolness of the night air. In the sixth cabin a candle burned. French would be awake, studying the advertising circulars he had picked up yesterday in Kinlock. Hallam paused in front of his door, then resisted the impulse to intrude. It would be a long day; let him have his privacy before it began.